Locals know it as the Heart of Dixie, and Lynard Skynard proclaimed it their sweet home: the state of Alabama. While geographically diverse with the rolling foothills of the Smoky Mountains in the North, open plains in the center and the Gulf of Mexico in the south. Alabama may not be at the top of your RV bucket list, but it should be. This makes Alabama an excellent destination for RVers. Here are our top five picks for Alabama RV parks, campgrounds, and resorts. If you’re looking to get lost in the spectacular beauty of Northwest Alabama, try a few nights in the Corinth Recreation Area. This quiet area is in the William Bankhead National Forest and next to Lake Lewis Smith. The area has full hookups along with large parking pads. Each pad comes with a grill and picnic table. Clean showers and restrooms are available as well. Take a stroll in the Sipsey Wilderness, nicknamed the Land of a Thousand Waterfalls. Sipsey is full of beautiful streams, waterfalls, old growth forests, and limestone bluffs. Nearby Lake Lewis Smith has 500 miles of shoreline with excellent freshwater fishing, boating and all types of watersports. We chose Cheaha State Park for its solitude and proximity to the fastest race on the NASCAR circuit. Cheaha is in the heart of the captivating Talladega National Forest. You can choose to take all your creature comforts with you in the improved grounds or rough it in one of Cheaha’s primitive grounds. All sites come with a fire ring, grill, and picnic table. 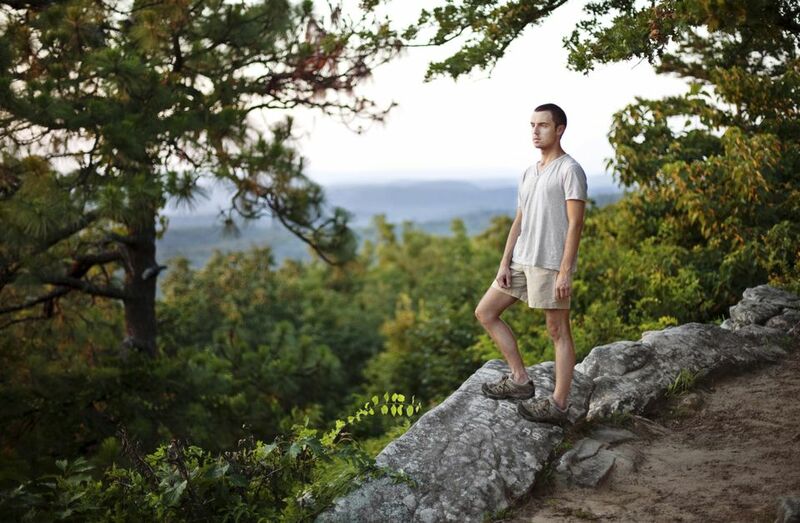 Arrive at Cheaha during the week and enjoy your time hiking, biking, fishing and getting plenty of rest and relaxation. Twice a year on Sunday drive the 25 miles to Talladega Superspeedway to tailgate and watch NASCAR’s elite rumble down the tracks with speeds creeping over 200 miles per hour. Oak Mountain State Park is a great base to call home as you explore the unique offerings of this charming southern city. Relax by the lake, go golfing, get some fishing in or explore the miles of mountain biking and hiking trails. Take the journey to downtown Birmingham, or The Magic City, to dine at critically acclaimed restaurants such as Highlands Bar & Grill or the Hot & Hot Fish Club. Catch a flick at the historic Alabama Theater or take a tour of Sloss Furnaces to see the foundries that built the Pittsburgh of the South. Talk about a fisherman’s paradise. Mountain Lakes RV Park is right on the 68,000-acre Guntersville Lake. Guntersville Lake has been continuously named one of the best largemouth bass fishing lakes in the United States. The BASSmaster’s Classic Championship was even held there in 2014. You will be well taken care of the park itself with electric, water and sewer hookups and Wi-Fi to boot. If you aren’t much of a fisherman, no worries, Mountain Lakes hosts an indoor and outdoor pool, boat rentals, game room, clubhouse and is within a few miles of some great hikes and scenery at Lake Guntersville State Park. The park is also host to the annual Mountain Lakes Music Festival in early November. Get down with some great bluegrass, folk and jam bands. Make sure you book early if you want to get a spot at the festival. Sugar Sands RV Resort takes its name from the white sandy beaches of the Alabama Gulf shore that are a hop, skip, and jump away, and that’s not at all this resort provides. You are well covered as far as utilities are concerned with huge 60 by 22-foot concrete parking pads with water, sewer, 30- and 50-amp hookups. Wi-Fi and cable are provided as well. There is a 5000 square foot clubhouse, resort style pool, laundry and shower facilities making this resort a place you can call home for a few days or a few months, all in a lush coastal setting. Outside the resort, you surrounded by the beautiful Gulf Coast with plenty of dining, golfing, shopping, fishing, and kid-friendly activities as well. It’s no wonder this resort got 10s across the board on facilities, restrooms, and appeal from the Good Sam Club.